A few years ago, I was extremely fortunate to meet Gina DePalma, the pastry chef at Babbo in New York City, thanks to the matchmaking efforts of Karen Page and Andrew Dornenburg. Being bakers, we struck up a friendship and she gave me a copy of her gorgeous book, Dolce Italiano. And after we had dessert and coffee together, we ambled the streets of New York City a little and made plans to meet in Rome, where she was moving to work on her second book. Unfortunately we didn’t get to have our Roman holiday, but I often thumb through her book and dream about how much fun we would have had lapping our way through the gelaterias of Rome and eating all those pastries with little sips of Italian espresso in between bites. 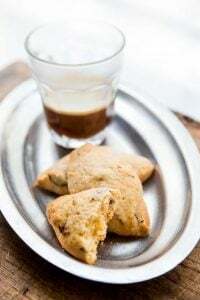 Her book is one of those exceptional cookbooks that makes excellent reading (as well as being an entirely enticing collection of recipes), especially the chapter on Italian ingredients, which isn’t just a rote list of what to buy. She discusses the importance of baking ingredients and what they mean to Italians: olive oil isn’t just to moisten, it’s a flavor. And why citrus figures into Italian desserts more often than vanilla. Come winter, I plan to make her Chocolate and Date Pudding Cakes, but since it’s summer, people with gardens are often bemoaning they have too many zucchini and are always looking for ways to use up their bounty. 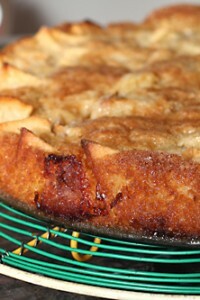 And with a crunchy lemon glaze, I had a hard time resisting making this recipe and sharing it. The genius of the glaze is adding granulated sugar, which gives it an especially profound sweet-lemony sour crunch. The glaze is not a looker (which finally made me break out my silicon pastry brush for the first time, and I’m never going back to bristles again) but it tastes amazing with the spiced zucchini batter and I’m happy to let looks step aside to give way to flavor. Us city-dwellers have to buy zucchini, which probably seems like folly to those of you out there with gardens exploding with zucchini of all colors, shapes, and sizes. And although I know you’d be happy to send me your surplus, I’d rather you bake one of these cakes for yourself. Or two. Or three. Adapted from Dolce Italiano: Desserts from the Babbo Kitchen by Gina DePalmaI used the fine grating disk for my stand mixer but Gina recommends if grating the zucchini by hand, use the fine holes on a box grater. I also think since you’ve got the grater out, you may as well add a few swipes of lemon zest to the cake batter, since you’re using the juice for the glaze, which I’m going to do next time.The best way to invert the cake is to lay the cooling rack over the top of the cake pan, then grasping both the cake pan and the rack simultaneously (if it’s too hot, wear oven mitts), flip them both over at once. Lift off the cake pan, then liberally brush the glaze over the warm cake. 1. Preheat the oven to 350ºF (180ºC). 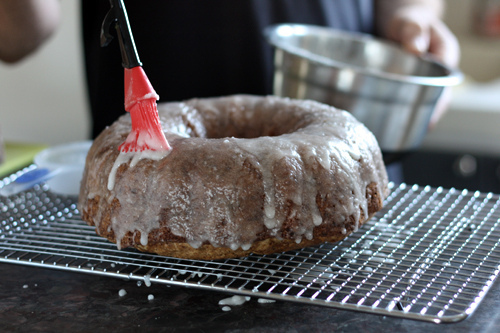 Grease a 10 cup (2.5l) bundt or tube cake pan* with non-stick spray or butter, dust with flour, then tap out any excess. 2. Pulse the nuts in a food processor until finely chopped. 3. In a medium bowl, sift together the flour, baking powder, baking soda, salt, cinnamon, ginger, and nutmeg. Set aside. 4. In the bowl of a stand mixer with the paddle attachment, beat the eggs, 1 3/4 cup (350g) sugar, and olive oil for 3 minutes on medium speed, until light and fluffy. Stop and scrape down the sides of the mixer, then add the vanilla. 5. Mix in the dry ingredients, scraping down the sides of the mixer bowl to make sure everything is mixed in well, then beat on medium speed for 30 seconds. 6. Stir in the chopped nuts and zucchini. 7. Scrape the batter into the prepared cake pan, smooth the top, then bake the cake for 45 to 50 minutes, until the toothpick inserted into the center comes out clean and the cake has begun to pull away from the sides of the pan. 8. During the last few minutes of the cake baking, make the glaze by whisking together the lemon juice, 1/3 cup (65g) granulated sugar, and powdered sugar. 9. Let the cake cool for 10 minutes, then carefully invert it onto a cooling rack. Brush the glaze over the cake with a pastry brush and let the cake cool completely. Storage: The cake can be wrapped (or put under a cake dome) and will keep for a few days. You can freeze the unglazed cake. However to apply the glaze, you’ll need to defrost the cake then warm it so the glaze will adhere properly. *If you don’t have a bundt or tube pan, I noticed that both Adam and Sara made the cake in a regular round cake pan with good results. This cake batter could also be baked in two loaf pans, which is easier for gift-giving, if you’re trying to share your zucchini bounty. You may need to reduce the baking time a little to compensate for the smaller pans. I’ve made this cake many times since I first got Gina’s cook book and everyone always raves about it – even those who turn up their noses a titch at the thought of zucchini in dessert. I’ve always made it in a tube of bundt cake pan and don’t think I’d want to use a regular cake pan – you want more edges and surface for the amazing glaze to crust over. You would not think that a simple lemon glaze would make such a difference but, baby, it does! David, is there any chance that when you write a recipe that contains nuts, you put an asterix* next to the nuts so that we know whether we can omit them. I really really really (can’t quite stress enough) hate the taste of nuts. I’m not allergic but if i get too strong a taste, my stomach starts reacting violently. Sounds delish! And the perfect outlet for all that zucchini from the CSA (one can only make so many zucchini breads with raisins and pineapple)! However, would it taste as good with less of the cinnamon, ginger and nutmeg? One of my kids is allergic cinnamon and I seem to only really enjoy this combination in apple pie. Thanks! I’ve made this cake several times, and it’s soooo good! The granulated sugar is a must in the glaze– last time I made it, I had just enough for the cake, and made the glaze without. Though quite good, it wasn’t as spectacular as previous attempts. If there wasn’t such armed and dangerous guardians of the rectitude, one could adapt any recipe in their own way according to their own needs, without having to bother for those expensive state cooking permits or R.O.G.R : recipe owner granted rights. It’s challenging to write a recipe to accommodate the various dietary needs so I generally trust that people who have dietary restrictions are in the best position to know how to modify recipes to address their particular concerns. Unless I try the variation myself, I can’t guarantee the results and oftentimes if ingredients get swapped out, folks aren’t happy the the results. In general, nuts and spices aren’t part of the ‘chemistry’ of a cake recipe, so can be modified; they are there for texture and flavor, respectively. Folks are always welcome to try variations and I welcome when they report back in the comments, as others may have the same or similar questions about a recipe. The lemon glaze sounds to die for. 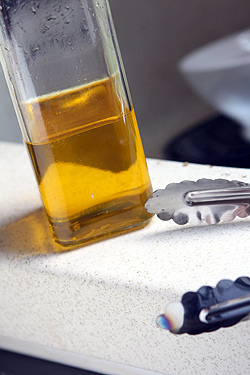 I love my silicone pastry brushes, too – they work so well and clean up easier. My neighbor gave me a set – aren’t I lucky! It seems like everywhere you go, people hand you their cookbooks. Can I sign up for your life? I’m a cookbook addict! Going to make that when I get home from my vacation!!! I have been trying to keep my baking to one day a week (it’s a waistline thing), but… but…. I have your book open on my desk and this recipe starred on my desk and a couple of Dorie’s recipes marked off and I’m thinking it will be WEEKS before I get to try all of them and maybe I should change it to bi-weekly ;). Plus, I think there’s something so homely and lovely about having cakes like this out on the countertop for visitors to munch on with a cup of tea. This is the perfect use for all my delicious Zucchini. Yummy. Thanks for sharing! Yes, , I also would never go back to my old brush. Love the silicon brushes. You knew we’d be looking for something to use up all the zucchini that’s so inexpensive and abundant at the market or in the garden! I’m so glad you posted this as I’m just overrun with the stuff. I’ve been making loaves and loaves of zucchini bread and was curious if olive oil would play nice in it. I worried it would feel too oily on the tongue. I will give this a try using some lemon zest in the batter as well. The ginger is the one spice I haven’t tried in it either. Love lemon and ginger together! When you specify to use the paddle attachment in the stand mixer, is it ok to substitute another attachment without affecting the batter? I think I lost my paddle attachment, and I usually use the whisk or the attachment that is white ceramic with holes in it (dont know what that one is called) instead. Just wondering if this makes a difference. Wow, since I’m up to my ears in zucchini, I can’t wait to try this. I love moist cakes and I love lemon….so this one has my taste buds tingling with anticipation. Can’t wait! BTW David, another great way to use up some of those mounds of zucchini is in pickles. My favorites are from Judy Rodgers at the Zuni Cafe. You surely remember those this chartreuse strips that come on the side of a Zuni Burger! The recipe can be found in Judy’s Zuni Cafe Cookbook (as well as the recipe for her shocking pink and spicey onion pickle). I don’t have a stand mixer (don’t have much space, and don’t bake enough). Would hand beating with a spoon suffice? Thanks! 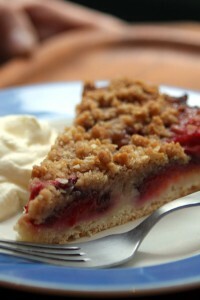 I made this cake once with a little bit of buckwheat flour, and it was spectacular! The crunchy glaze was an awesome takeaway though – I’ve been putting it on everything lately! Perfect timing for the zucchini recipe, thanks! I have enjoyed your recent posts featuring Italian baking. When I was in Florence a few years ago during Easter time, I had a sweet rosemary bread that was so good it stuck with me ever since. I’ve never found a name or a recipe for it. Maybe it could be specific to Tuscany? Anyway, I thought it was called Rosmarino, but that’s just Italian for rosemary… darn. Have you ever heard of this? It’s a baking mystery! Making this tonight to help use up the five zucchini currently in my fridge (though I’d probably buy zucchini to make it if I didn’t have my own supply)! It will be a nice dessert after the pasta with grilled zucchini and onions we’re having for supper…. David, do you think this recipe would work with grated yellow summer squash instead of zucchini? I have this giant one sitting around that I need to use up, but don’t know if it would throw off the flavor or texture. I hope you can enlighten me! Can you clarify – Step 2 has us grind the nuts until fine, but Step 6 says to stir in the chopped nuts. Same ingredient? I just want to be sure I’m not missing out on any chopped nuts that are also supposed to be included! The three nuts suggested in the recipe have very different flavors – just curious which you (or anyone else who has made this) used. 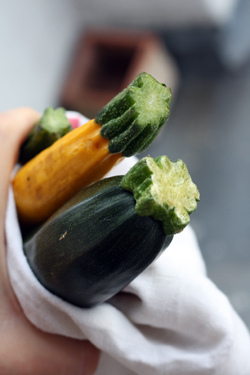 I love that the recipe uses olive oil–must be delicious paired with the zucchini! I’ve been craving zucchini cake for a week now, just in time! Zucchini cake reminds me of my childhood visits to the farm where my mom grew up in North Dakota. I have never tried it with lemon, though. Can’t wait to try! Thanks! Yes, please, David, I second the question from KV on the nuts. Grind or chop? Thanks for posting what looks like a delicious summer cake. i only wish i had a slew of zucchini lying around my house, or in my nonexistent garden. although, they are rather cheap and all over the markets, so its not like it’s hard to go grab some! Annie: I would order another paddle attachment–that’s the one I use all the time! You could use the whip until you add the dry ingredients, at which point, you can mix the rest by hand. Jill: Actually, I had some corn flour and was thinking of swapping it out for some of the flour, but thought I’d stick with the recipe as is. Next time, though, I’ll give it a try. Thanks for letting me know that it worked for you. Jean: I believe using a spoon and beating it well would do the trick. KV: I chopped the nuts very fine in my mini-chop food processor. So folks can use one of those, or hand chop them. They should be in fairly small pieces. I used almond for this cake, since that’s what I had on hand. Maddie: As you can see from the photo, I used both yellow and green zucchini in this cake. Worked great! James: I’ve made both those recipes and they turned out great. The recipe for Zuni’s Red Pickled Onions is here. Great pics too!! Thank you for sharing your story. I would love to be able to share some of my zucchini! I have three or 4 varieties, including a white patty pan and an eight ball. I’ve also been using zucchini blossoms —helps keep the zuc population down. Any good zuc blossom recipes from the marches? Gad-zukes! It’s a great cake! I made it in winter, so blessed be for the reminder. I made this cake tonight with big chunks of pecans because I like the chewy texture of the bigger pieces. It was so good my family gobbled it up. If you don’t want to use nuts you could always use toasted pumpkin seeds and sunflower seeds. I just discovered your blog when I was looking for some tips on preparing leeks. I am super excited–I made the vinaigrette the other night and was so pleased! Unfortunately, however, I don’t have an oven at the moment (I live in China and they’re underappreciated here), so I won’t be able to try this cake until I get home. However, it looks divine. I really enjoy your blog posts as well! You really are living the sweet life! Zuccini in a cake! Wow that is a crazy combination… I should really give this a try! Somewhat related–my parents’ garden is not bursting with zucchini, but is instead practically blushing from the extraordinary number of tomatoes. Have you ever seen a recipe from the sweet side of the pantry using tomatoes? A tomato cake (maybe that doesn’t sound so good…) or tomato pie? Not like a tomato tart meant to be served as a savory dish, but it seems like there should be something where a tomato is actually treated like a fruit? My mom used to make zucchini bread all of the time during the summer, our garden was abudant with fresh zucchini. I look forward trying to your recipe I never did a lemon glaze on zucchini bread. This recipe looks great. 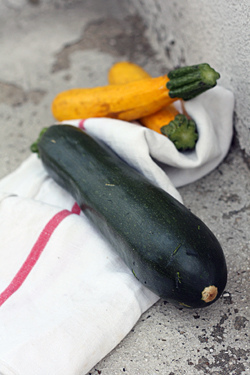 My zucchini are growing and I am collecting good recipes to use them in. I’ll add this to the list of possibilities! Now I know what I am making for the kids breakfast, yummy! Is it OK to give my children icing to start their day? I say heck yeah, its vacation time! Wow, that surely looks and sounds like a healthy cake! :) I think I would give it a go and hear my kids’ say about it. I’m a little worried about the color though, it looks like the color of a whole wheat bread, not exactly my kids’ favorite. But they’re really patient with mommy’s cooking and love having the last say about mommy’s new recipe, lol! Love those kids! I make a zucchini cake with absinthe (in the cake and in the glazing). I think this combination would work nicely with this recipe too (doing away with vanilla, nutmeg and ginger). I like the idea of putting coarser sugar in the glazing to add crunch. I’ve never used olive oil in a baked good before and this seems like the perfect recipe to try. On another note, I hope to see you at your stop in NYC in a few days! I love the idea of this cake as muffins. Think it would work to simply bake this batter in muffin tins and glaze each individual muffin? Crunchy Lemon Glaze got my attention on this post! I’m here with my morning coffee thinking that a slice of that would be perfect right now!! Don’t you love the silicone brush?! I love mine, it’s such a brillant idea! I have her cookbook, and had the first thing I tried was her ricotta cheesecake. The whole while I was making it I kept thinking “shouldn’t the ricotta be drained”? Well, I went with her instructions sans draining and it was a total disaster…wet, the crust was disgusting and water logged. I had prepared this for guests and was horrified by the results. I haven’t opened the book since, it is lovely and I had high hopes. But, I will give her a shot again since you posted this. I guess one learns after a bit to not trust every expert and to listen to that little voice inside…even when you think “they” know everything! Oh Non !!! Je viens juste de faire de la confiture avec mon trop plein de courgettes: j’aurais pu faire votre magnifique gâteau! Big sigh: I’ve just made jam this morning with my surplus of home grown courgettes !!!!!!!!!!!!! Hi Dave- Just want to tell you I love your site-so glad I stumbled upon it. Just ordered your book Ready for Dessert & I think I’m going to order Dolce Italiano as well. I will defintely be making the zucchini cake today! Thanks again! I love zucchini cake. That just looks lovely with the lemon glaze. 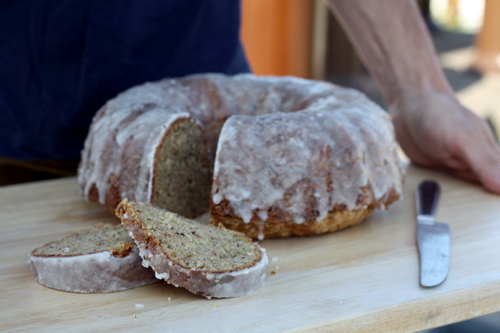 …cannot wait to enhance my zucchini bread recipe with this one…the glaze sounds divine !!! Thanks, David !! I made this last night with almonds. It was fantastic. The cake is moist and delicious and the glaze is really quite wonderful! Who knew that just a little granulated sugar would elevate a glaze like that. Thank you for sharing this recipe! I did it!! This cake is heavenly good. The lemony crunchy glaze is amazing. I had some leftover so I put it on blueberry scones that I had already made. For the cake, I used pecans, I used one cup of all-purpose flour and one cup of whole wheat and I did grate some lemon zest when I grated the zucchini. David, thank you so much, I absolutely loved this cake. My friends and parents were particularly intrigued to find out that its fat base is olive oil–they loved the taste, and they also loved that it was (relatively) healthy! That being said, I was wondering if you could point me to more desserts which incorporate olive oil, or at least explain to me how olive oil works in a baked good compared to say, butter. Don’t get me wrong, I would never compromise taste for healthy substitution when it comes to these recipes, but the deliciousness and healthiness of the olive oil is intriguing! Thanks for your great work, I look forward to your next recipe. Wow! I’ve never had a zucchini cake. I think not even heard about! Have to make it and come to leave a further comment after that. Thank you for the inspiration and the cook book suggestion! This recipe looks great…can’t wait to try it! One quick question, David. When you make this, do you use type 55 flour? I live in Poland now (used to live in Poitiers) and they basically have the same system as France, but with an extra 0. So, I can choose from anything between 400 and 650 in most stores. I usually use 550 for my AP flour, but with mixed results. Do you blend or use just one type outright? Thanks! Shannon: You can check out the post that I’ve linked to at the end of the recipe about American Ingredients and their French Counterparts that I use. This cake was made with T65 flour. Teresa: Thanks for the report and glad to know it worked out! When I make zucchini bread I add cardamom along with the other spices listed in this recipe, so today when I baked this cake I added 1/4 tsp. cardamom to this as well as the lemon zest as you recommend. So. Good. I’ve had Dolce Italiano on my wish list, off, on again and off again. I’ll put in on and it’s only coming off when I buy it now.! Laura and Paula: Thanks for the report. I love cardamom (although opening all those tiny pods and grinding them up is a bit of a chore), and I too, like whole grains. I’ve not tried that white whole wheat flour, but whole wheat pastry flour is another option, I’d imagine. Just made this and the quantities made me 3x340g loaves (in those disposable silicone coated paper moulds), plus 12 cupcake/muffins. The glaze is delicious…though I used demerara sugar instead of granulated. Perhaps this is why my glaze is not as white? I made this cake last night and it was absolutely delicious and moist! I got a little nervous though when I was hand grating the zucchini because it was producing a lot of extra liquid which I was afraid would effect the consistency of the cake. I tried pouring most of it off but didn’t know if you experienced any problems like mine. We just got a large zucchini from our CSA and I was going to default to chocolate zucchini cake. I’m baking this instead! I returned home from vacation this week to find two massive zucchinis in our garden. I used one to make this cake last night with pecans and I grated some lemon zest into the batter as suggested. It was fabulous and the folks at work and at home just loved it! The only problem I had is that I must not have prepared my bundt pan well enough because the top of the cake stuck to the pan. Despite missing its top crust, the cake looked great after I glazed it and cut it into serving sizes, and nobody was the wiser. That lemon glaze is awesome! Thanks for a delicious recipe that came at just the right time. I’m going to make another one with our second huge zucchini this weekend! Thanks for the link and the answer, David. I had actually read that post before and just forgot about it! Anyway, I’ll use 650 for the cake when I make it this weekend. By the way, I like what the Chow post said: “flour, like wine, reflects terroir.” This explains why every sack of flour I buy here in Poland is labeled with the region where it’s produced. I used to think that was a bit silly, but now I know I just need to bone up on my regions so I can pick flour from the one best suited to my baking needs. Anyway, thanks again! This was a huge hit with my family. It only used up *one* large zucchini though…. I was worried about the amount of liquid coming off the grated zucchini, too. I left behind what juices collected in the bowl and let the zucchini drip a bit before I added it. But there was no smoothing out the batter in the pan, because the batter was quite wet. I had to bake the cake an extra 10 minutes or so, and I think it might be helpful to let the grated zucchini drain in a strainer while the rest of the cake is prepared. The lemon zest in the cake is lovely, and the lemon glaze divine. I’m thinking of adding some raisins next time. However if you do find it has liquid in it, I would imagine it would be best to drain any off. I just made a mocha chocolate chip zucchini cake this evening to use up some of my surplus. Since my family loves anything with lemon icing or glaze, I’ll have to try this next. Sounds delicious and healthier than the chocolate one. I made several changes successfully, and this cake is yummy. First, I used whole wheat pastry flour (180g) and pulverized buckwheat groats to a flour (100g) in place of all-purpose flour. Next, I added grated zest from half a large Meyer lemon and could have used all the zest. Then, I reduced the oil to 3/4 cup and reduced the sugar to 1-1/3 cups (240g). It took me a few days to work up the courage to reduce the oil and sugar but this worked very well for me. I might prefer Meyer lemon sorbet to the glaze. Thanks for the post, David. Thank you so much for sharing a fabulous recipe! This is a perfect snack cake without the glaze and is a lovely treat with it! I toasted some pecans and decreased the sugar to 1 1/2 cups. I also used all white whole wheat flour. for those who cannot take nuts, i think it is possible to just omit it in this case, as there is enough flour to give structure. but as mentioned above, it would change the texture a little and the batter might be a little wetter. i don’t have zucchini on hand right now.. maybe i will try this with squash, which i have plenty of at the moment. the spices are right for it – like a pumpkin pie cake! have you ever used almond oil in baking? i happen to pick up a can while waiting for my connecting flight in dubai… and all i see online are ways of using it for the skin and that it is good in salads. i’m assuming it is sweet almond oil, it doesn’t say otherwise. brand is Well’s. btw, i want to thank you for including the weight measures in your recipes. i’ve long since switched to baking by weight, and it helps a lot, especially when making double or triple batches. plus, i get more consistent results. Thank you for posting this as well! I just it this morning as a birthday cake to take into work and like the others, added some freshly ground cardammon and the lemon zest you suggested. Very tasty and I won’t tell anyone about using olive oil until after they’ve had some! I made this cake on the weekend and was VERY impressed! I love the spices and it was extremely moist. My icing, however, didn’t harden like yours did (perhaps the cake was too warm?). Would definitely make again. thanks so much for posting! why are there two sugars in the glaze? is the granulated sugar necessary for the crunchiness or does it serve another purpose? I have used zucchini in baking for many years and have always wondered if the size of the zucchini in baking makes a difference. I have learned that using a very large zucchini in savory dishes the flavor is lost. Do you think the same applies to baking? I was fortunate enough to be overloaded with zucchini, and made this yesterday. I used a normal cake pan (didn’t have a bundt tin)and found although cooked to time, when turned out onto he rack..the middle was still mush! I was so worried, as the spicy scent had driven me to a starving mess & couldn’t think of giving up!…I returned the cake to the oven (mushy middle upwards) & baked again….the result was superb! Moist, almond-y, nutmeg-y lushness! I adore this cake! I swapped in 1/2 C spelt flour for regular flour, because I have been enjoying experimenting with spelt since I tried Kim Boyce’s olive oil cake. Spelt lends a luscious, subtle caramel flavor and tight crumb, but overall I prefer to keep it in a supporting role so that white flour can maintain the ideal structure. I have been storing the cake wrapped in the refrigerator, and it has stayed fresh for almost 5 days now! It isn’t drying out the way that butter-based cakes do, and the glaze is still crunchy. My girlfriend didn’t care for what she called the “grittiness” of the glaze. I am okay with it, but I am thinking about creating a glaze with a bit of olive oil next time, to really perfume the cake with that seductive olive oil aroma. So glad I checked your blog the other day as I have gobs of zucchini in my garden. I halved this recipe, knowing that I would be the only one in the house to eat it – and eat it I did. It baked up beautifully in a loaf pan and the lemon glaze was such a refreshing change from cream cheese frosting and it meshed so well with the zucchini and spices. Definitely a keeper! I made this cake for work yesterday, and it impressed. So much so, that two of my co-workers went home that night and made it, too. Success! P.S. I’m making it again for the family this weekend. Thanks for this keeper! David, I am not usually a “zucchini in cake person”, but with this recipe you may have won me over!!! I used “levure chimique” for “baking powder” and my good ol’ box of Arm and Hammer (thanks, Mom!) for “baking soda”, using your quantities. We had two bags of French 45 flour so I used that. 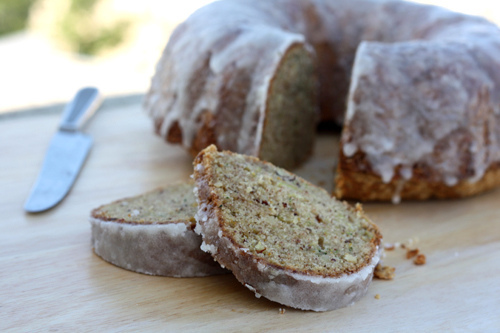 Having an abundance of zucchini from my garden I think this cake will be the perfect treat for my children tonight. I’m going to try it with crystalized ginger and gluten free flour (my own mix) and I’ll let you know how it turns out. Can’t wait to try it. My second of this zucchini cake is in the oven now (the first one was originally made for a dinner party gift for a dinner party that was cancelled. We savored every last bit for the following week to come.) It was so delicious that when I got more zucchini from our organic “panier” and another invite, I had to make another one. I’ve been missing it since we finished that last piece. A cup of olive oil is a little too rich for me, so I used a half cup and 125ml plain yogurt and it was so moelleux and delicious, while keeping the olive oil flavor. Used a loaf pan and cupcakes for the overflow. the cupcakes worked well with the glaze, but were more dry and not as good as the cake. Oh, and i ordered the book for my fiancé, who used to live in sicily. My cake turned out fabulous. I used 8.82 oz of gluten free flour (brown and white rice mixture with corn starch and xanthan gum) the consistency was perfect. I put about 1/2 teaspoon of lemon zest in the mix as suggested in your notes at the top. I also used crystalized ginger finely chopped instead of ground ginger. I ended up toasting the walnuts whole in butter and agave nectar and then finely chopping them. The result was a perfect cake. The only change I think I’d make for next time is a little less lemon in the glaze, it was just a little too much for the kids and I.
I made this cake the other night and am thrilled with the results. I baked it in bread loaf pans, because I need to go buy a bundt, and accidentally forgot the vanilla, but it still tasted great. The crunchy lemon glaze is the best part. I brought the leftovers into work this morning and the best compliment of the day was from someone who said, “The flavors in this cake are so complex and delicate, I never would have expected it from a home baker.” Win. Thanks for the great recipe; I will be making it again! I made this cake last night sans nuts because I burnt them while grating the nutmeg and in two square disposable cake pans and it was dynamite. I took it to a party and the people there devoured it. I can’t wait to try more desserts with olive oil, to buy this cookbook and to eat this cake again. Thanks so much for sharing. The cake is divine! This cake is amazing and I would very much like to use it in the Baking program I’m currently enrolled in (you would get full credit). I have to make a 10″ triple layer cake for my final project, do you think if I scaled the recipe up it would work. I’m also looking for suggestions as to the filling and icing. I love the lemon glaze and would like to incorporate something similar, perhaps in the filling. My current plan is to ice it and decorate it with a combination of toasted nuts around the base and perhaps candied lemon peel around the top. PS. I’ve just purchased ‘Ready for Dessert’ and ‘The Perfect Scoop’ having sworn off cookbooks quite some time ago – I just couldn’t resist and am very happy that I didn’t. Made this for today’s Labor Day potluck picnic. It was wonderful! 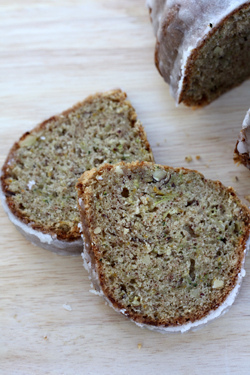 A lighter, fluffier version of zucchini bread. I was kind of worried because when mixing the sugar, eggs and oil it never looked like anything I would call “fluffy.” That always throws me off in recipes but then I’m fairly literal. It also broke into four pieces when I tried to dump it out of my pan. Totally my fault but I was able to squish it back together and the glaze did a good job of hiding it, though it wasn’t as white as yours. I put a little lemon zest in my glaze because I love lemon! About half was eaten by the time we left and it was competing with brownies and cupcakes, etc. Thanks again for a great recipe! This cake is in my Top 3 David, it’s amazing how every single ingredient mingles in an unique flavor. And the glaze is the piece de resistance. I got amazed after every single bite. Thank you for the recipe! However, does the cake have a strong olive oil taste to it? Is it perhaps better to replace the olive oil with other vegetable oil that is less prominent, such as canola or soy oil? I made it from the zucchini leftover content. I used half the amount of oil and much less sugar than what is required in the recipe and it still came out great. No, the cake doesn’t taste of olive oil. this was a huge hit. i made this with fresh zucchini this summer and my dad, a big lemon lover, told my mom to get the recipie. I made the two loaves and they cooked through perfectly. I made this cake today to the letter except that I reduced the sugar a bit. It turned out just fantastic. I took it to playgroup for my son’s birthday and they all raved about it, and have now passed around the link to this page. I roasted the walnuts well in advance and it made a huge difference. People commented that the crunchiness of the walnuts really added to the character of the cake. A lot of them had never heard of zucchini cakes. A big hit!